Reed Bunting breed from the British Isles and north west Europe, south to France and east to the Urals, with most northerly species migrating to southern Europe and North Africa. There are subspecies in southern and eastern Europe and in Asia. 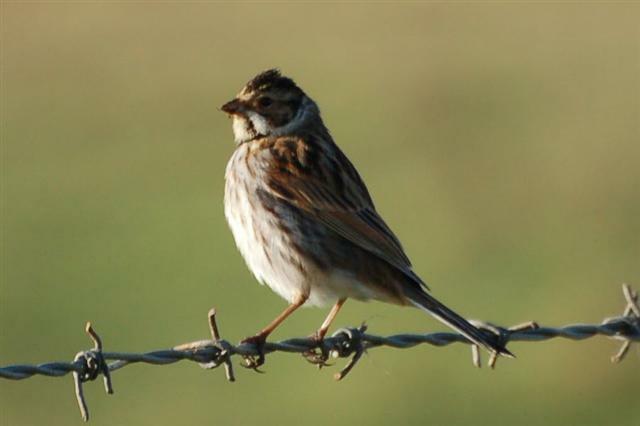 In Scotland, Reed Bunting is described as a common resident only absent from high ground and some islands. Small numbers of continental breeding birds occur on passage, some of which may remain during winter. On Arran, Reed Bunting is a resident breeding bird and passage migrant but it is one of these "brown species" that is easily overlooked. Reed Bunting as the name suggests inhabit reed beds and other wetland habitats including boggy field corners and grassy fringes of ponds and wet ditches. In winter the birds tend to move to drier habitats such as overgrown ditches, hedgerows and gardens. Grasslands that are not grazed or cut in the spring, such as arable field margins and hay meadows provide good sources of food . They also find seed on cropped land, such as winter stubbles and weeds in the crop margins. 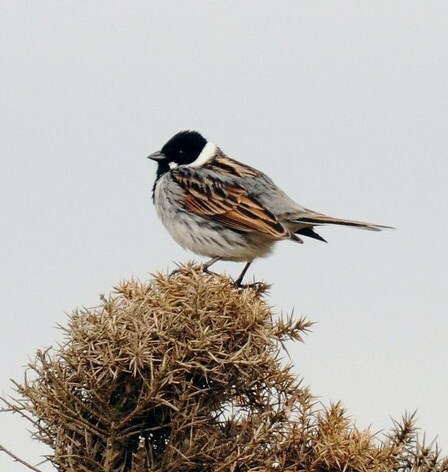 Sparrow-sized but slim and with a long, deeply notched tail, the male is unmistakable in its breeding season plumage of black head with broad white collar and white moutsachial stripe. Females and winter males have a streaked head. In flight the tail looks black with broad, white edges. Reed Bunting is usually monogamous having one partner, very occasionally polygamous, but males frequently stray to cuckold other males. Up to half of chicks have been shown to have been fathered by extracurricular mating. Breeding territories can be up to a square mile depending on the availability of food. The song is not striking melodious, consisting of sibilant intermittent flurries of rolling notes concluding with more rapid trills. The song is usually delivered from a prominent but subtly concealed perch at the top of bushes or reeds. This song along with the visual stimulus of ruffled black and white throat feathers lures a female into the territory.